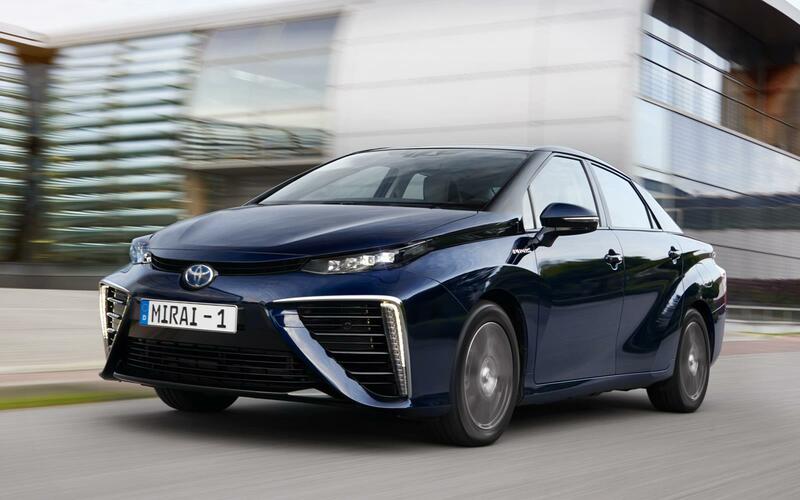 Mirai-cle on the Elbe: Hamburg drive of Toyota’s fuel cell car reveals the potential of hydrogen, but big investment is needed for fuelling stations. It seems somehow appropriate that I sit here writing these words on the 21st of October, 2015 for this is Back To The Future Day. It’s the day and date upon which, in Back To The Future Part 2, Michael J Fox’s Marty McFly arrives from 1985 into the future. Yes folks, from today, technically, the Back To The Future film series takes place entirely in the past. There is a car connection to all of this, and nothing to do with a defunct DeLorean. To publicise the arrival on sale of its (and the world’s) first-ever series production hydrogen fuel cell car, the Mirai, Toyota got the stars of Back To The Future, Fox and Christopher Lloyd, back together to ruminate on what future predictions the film got right and wrong (linking the Mirai’s hydrogen fuel to the fusion-powered DeLorean’s reactor), and to drive and experience the Mirai itself. The video is on YouTube and for anyone who’s a fan of the films, it’s a delight. 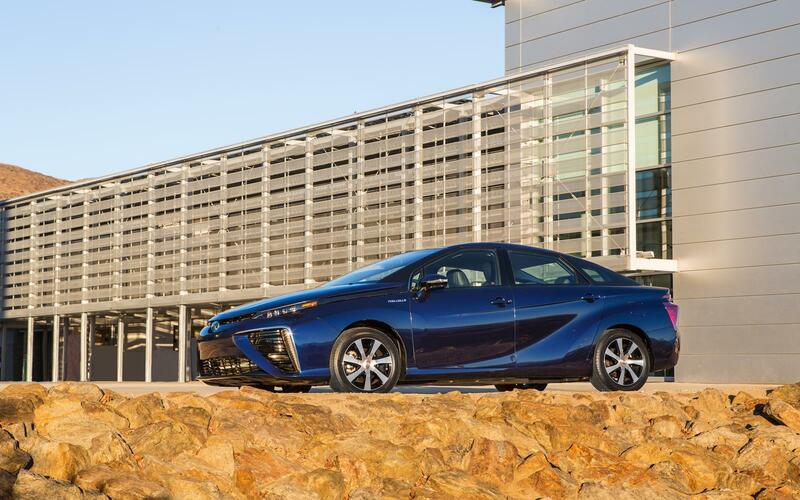 You won’t mistake the Toyota Mirai for anything else on the road. 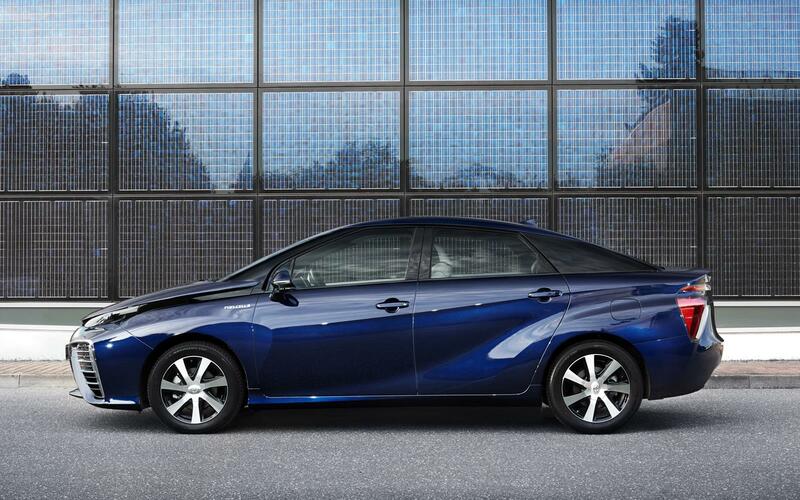 The distinctive front end of the Toyota Mirai hides a hydrogen powered motor. 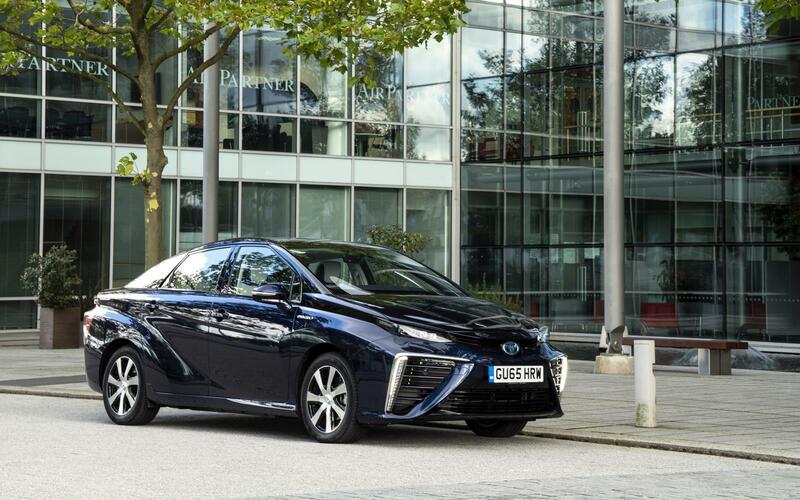 Powered by compressed hydrogen gas, the Mirai’s only emission while driving is water vapour and if you’re lucky enough to live near a hydrogen fuelling station (don’t bother looking too hard – there are only six public sites in the UK, and none in Ireland yet) you can refill the tank, and travel another claimed 330-miles, in just five minutes. 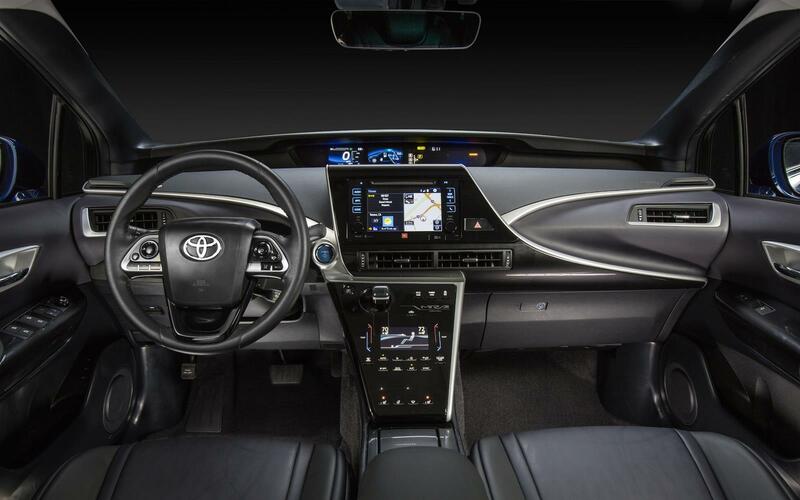 It’s an electric car without the hassle of charging times, and Toyota reckons it is the future. 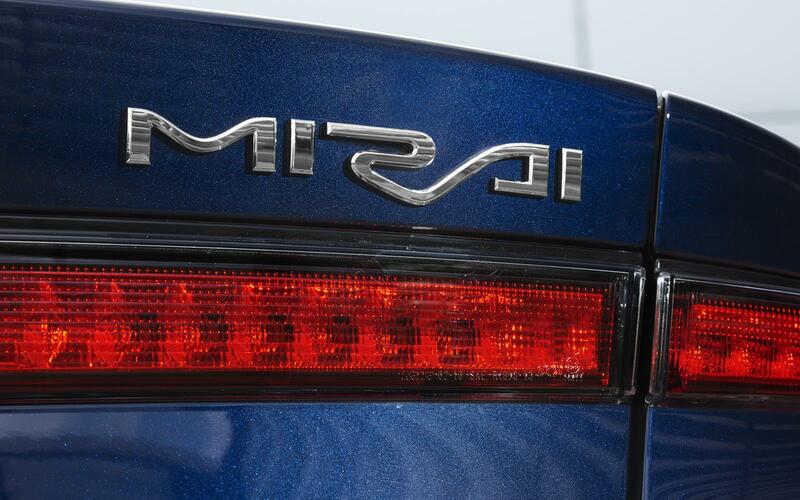 The word Mirai actually means future. Is it though? Can it be? Can any one car truly claim to be the future? Well, according to Toyota, it’s actually only part of the equation. 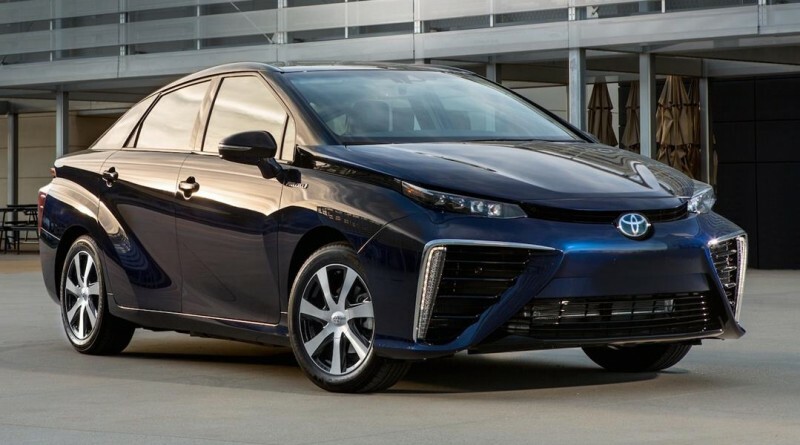 Announced the same day as we were driving the Mirai, Toyota wants to essentially end production of internal combustion engines by 2050, but the Mirai is part of the solution, not a totality. 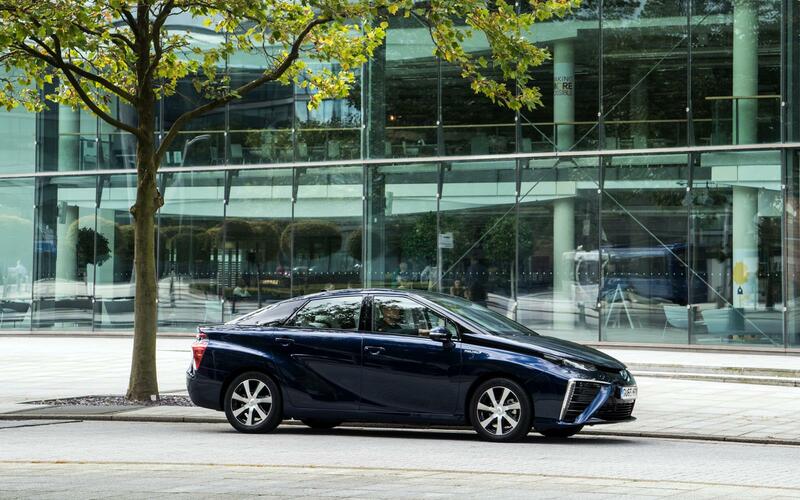 Filling up the Toyota Mirai is as easy as filling up with petrol. 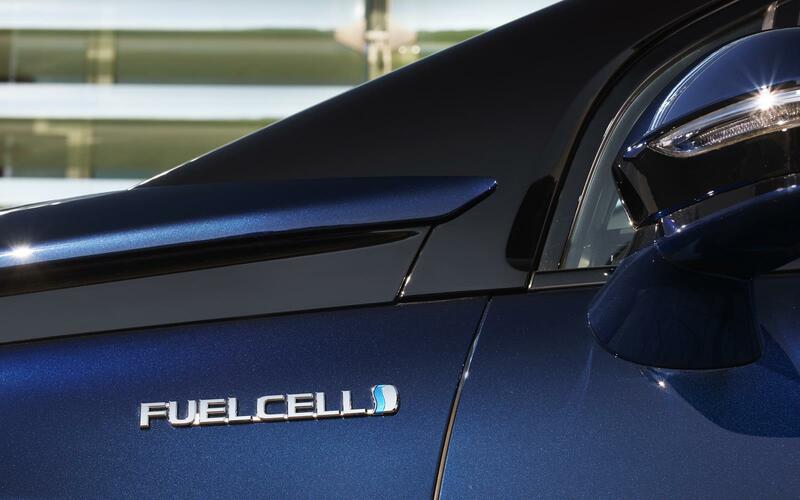 A hydrogen fuel cell in the Toyota Mirai provides electricity for the motor. 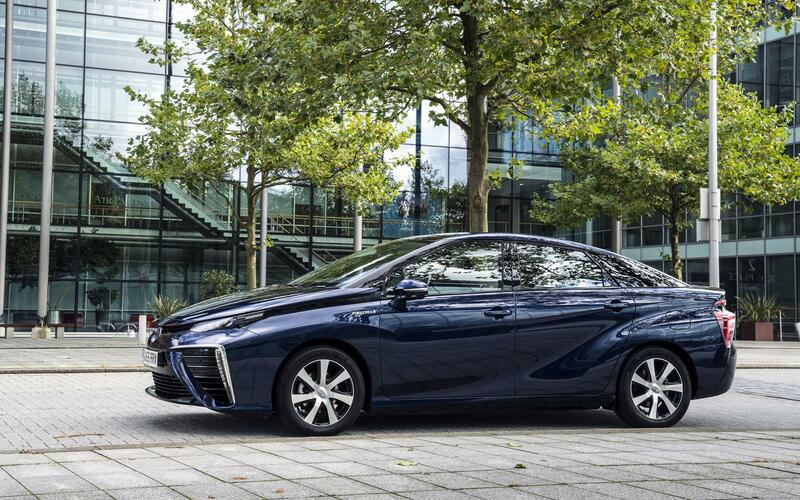 The Mirai doesn’t. 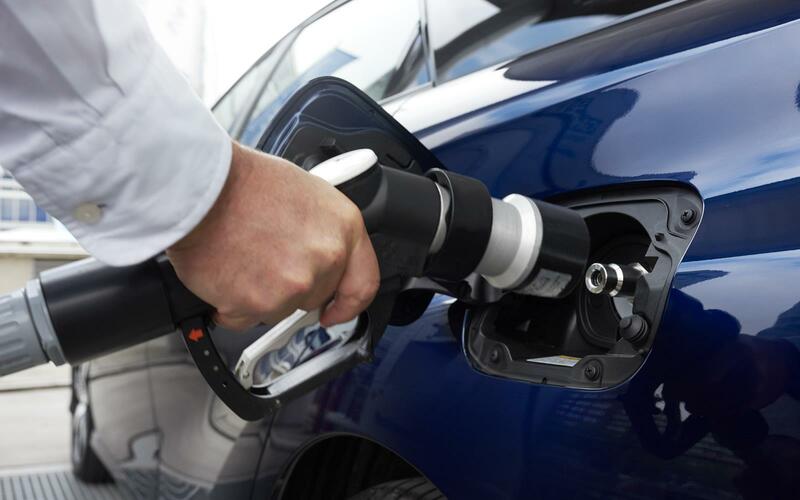 Assuming you’re lucky enough to live near to one of the UK’s half-dozen hydrogen fuelling stations, you can simply pull up, connect a pressurised hose and be on your way again in less than five minutes. It’s surprisingly normal, especially considering that once upon a time hydrogen stations had to be partly robotised as we fallible humans couldn’t be trusted with compressed airship gas. Now it’s as simple and as easy as filling up an LPG car. We got to drive it around Hamburg, which relative to the almost total absence of hydrogen stations elsewhere in Europe and the UK, is positively heaving with them. 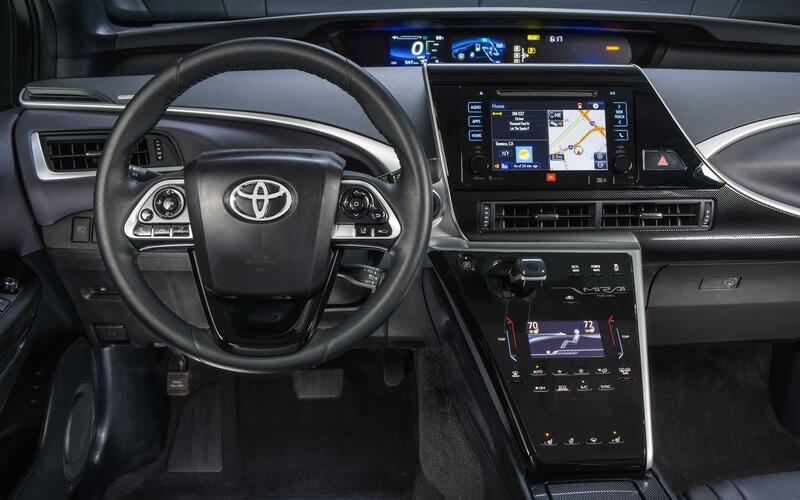 Inside the Mirai, the cabin is basically like that of a Prius, but with some nice design flicks and flips (check out the way the passenger side of the dash merges with the centre console). You can find some cheap switches if you poke around, and some of the digital dials look a touch cartoon-y, but overall it feels just about worthy of its £66k price tag. 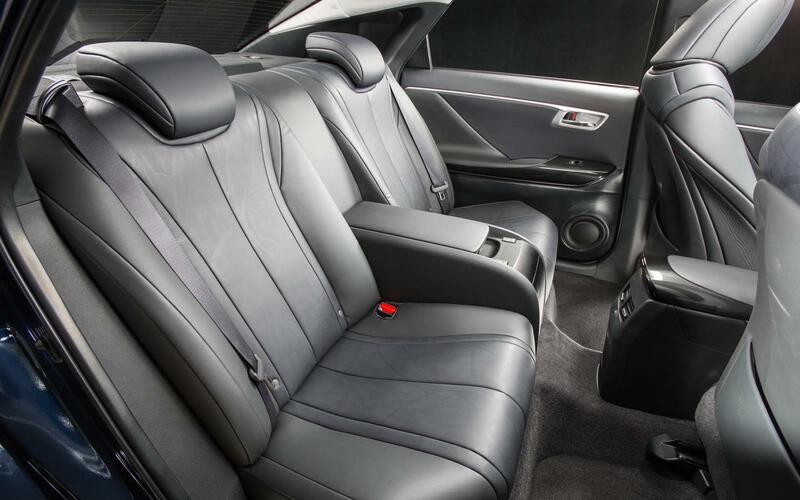 The Toyota Mirai’s interior just about stands up to the £66k price tag. 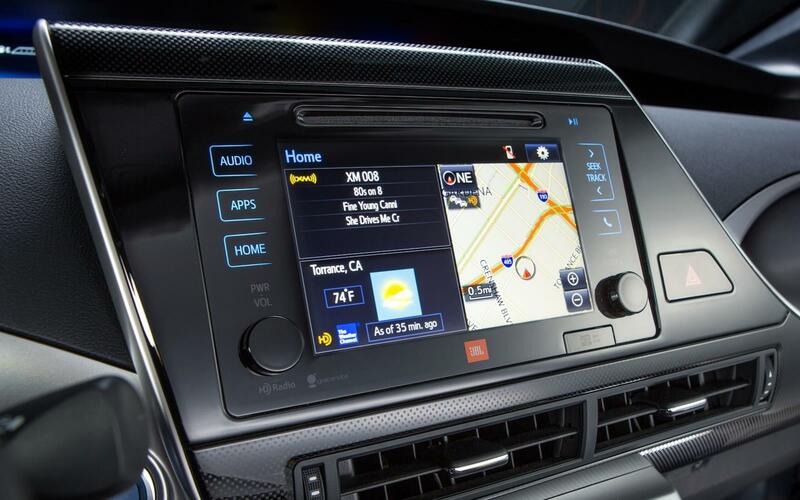 A boldy styled dashboard sets the Toyota Mirai apart from the Priius. 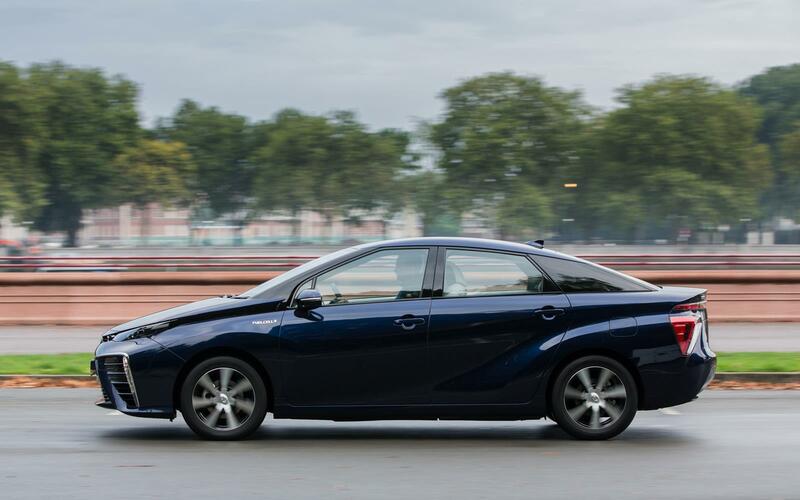 Spacious and comfortable, the Toyota Mirai makes for a sensible family car. Just like in a Prius, you push a stop/start button, wait for the green ‘Ready’ light and then tug the small, stubby gear shifter back and left into D and off you go. 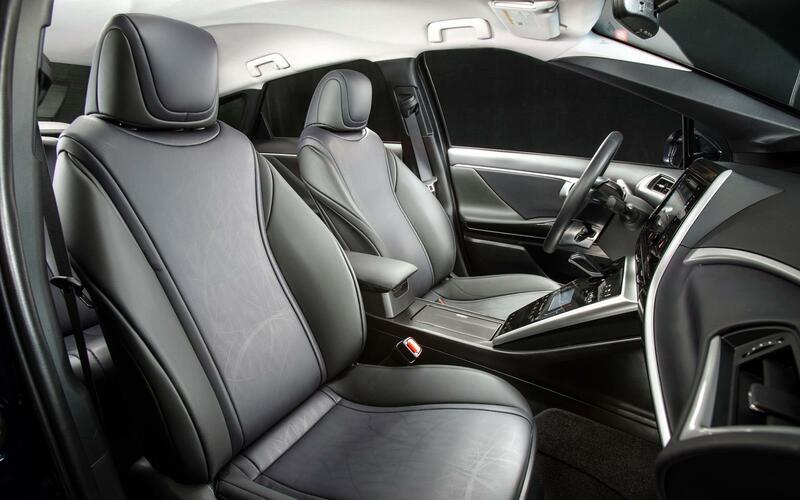 There is very little noise, just a few whistles and whizzes from the fuel cell stack under your seat (“why yes, I do own a £60-grand mid-engined car…”) some of which are artificial so that you know you’re up and running. 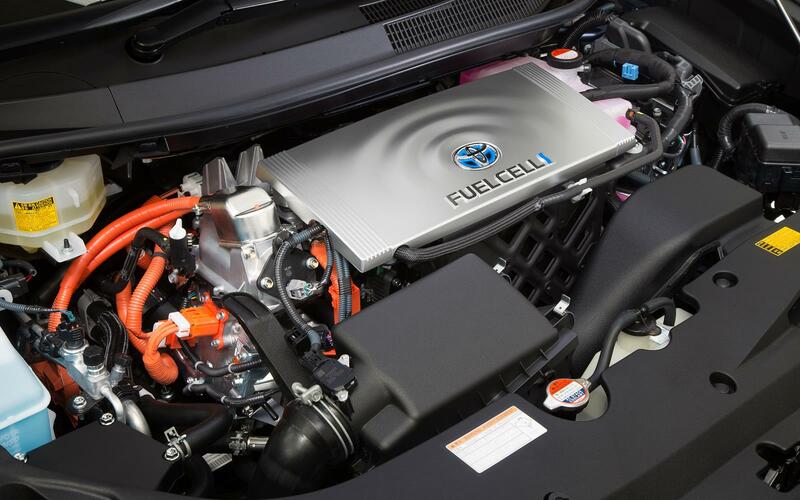 Around town, as with a Prius, much of the motive power comes from a nickel-hydride battery which stores energy recuperated from the brakes or when coasting, and adds it to the fuel cell’s 154hp when needed. It’s comforting and soothing to drive around town, albeit the brakes could do with a little more bite at times. The steering’s too light too, which dissuades you from trying to have any fun, but actually the Mirai handles capably enough, helped by its low centre of gravity and good weight distribution. There’s no point nor reward in door-handling it on back roads, but as a main-road cruiser it’s actually kind of hard to beat. And, unlike most current electric cars, fast motorway runs don’t have the estimated range huddling in a corner and crying, while you desperately try to conserve energy by throwing your passengers out on the hard shoulder. But, back to the Doc Brown question – is it the future? Well, it probably is not least because Toyota says it will be, and the biggest car company in the world doesn’t make many wrong bets. 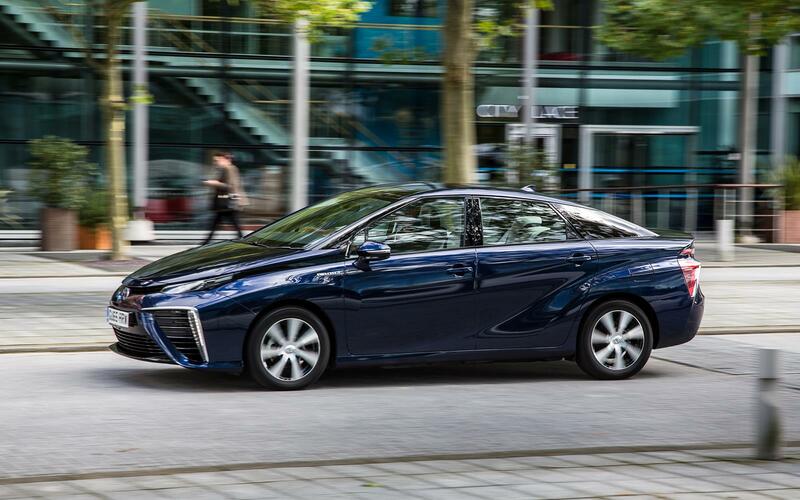 Toyota may even itself start investing in some hydrogen filling stations, which cost in and around £800,000 each. If a network can be properly built up (and with pressure for one coming not just from Toyota but from Hyundai, General Motors, Honda and Mercedes too) then this starts to look like an even more appealing prospect than a big-range electric car like a Tesla. Assuming the infrastructure’s in place, it’s just so easy to use and drive. Challenging to look at? Yes, definitely (although that’s as much as statement as anything – Toyota didn’t want it to blend in). Incredibly expensive? Yes, that too, but remember Toyota is losing potentially hundreds of thousands on each Mirai thanks to the colossal R&D costs. Is it genuinely useable? 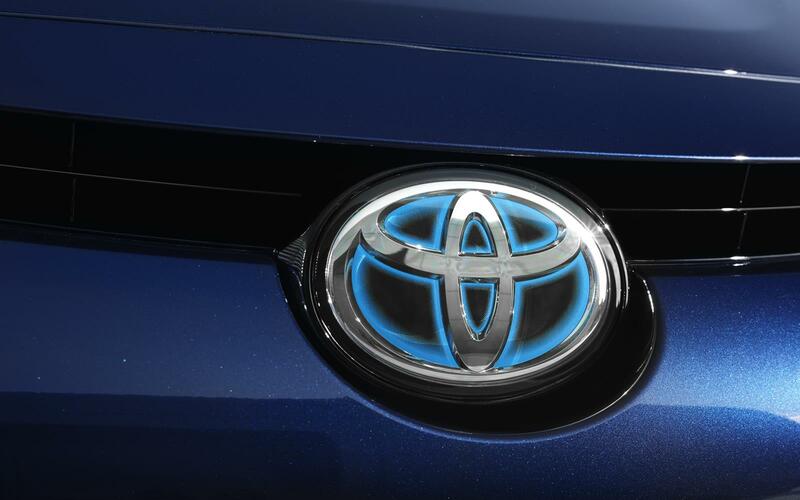 Yes – it’s easy and pleasant to drive and Toyota says it’s cracked the cold-climate running problems that plagued early prototype fuel cells. But the future? Certainly part of it. Along with hover-boards (one of which Lexus has now made) and self-tying sneakers (which Nike says it’s genuinely working on). All we need now is flying cars and time travel and we’ll have the whole set. 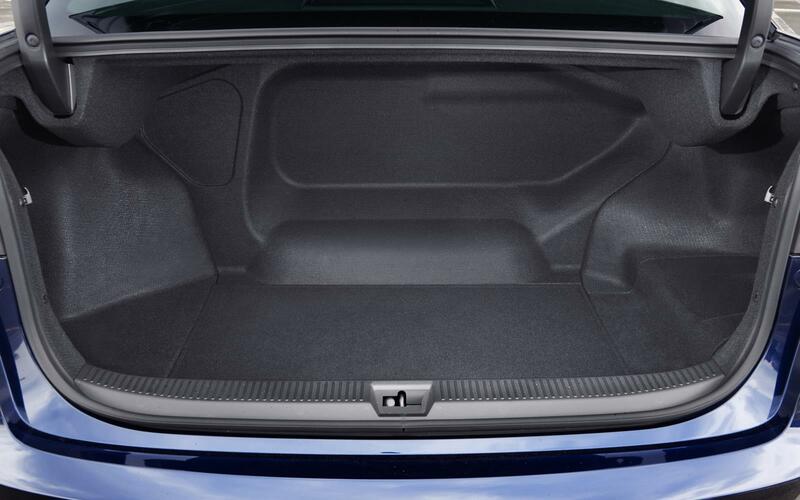 The Toyota Mirai’s rear space is good. 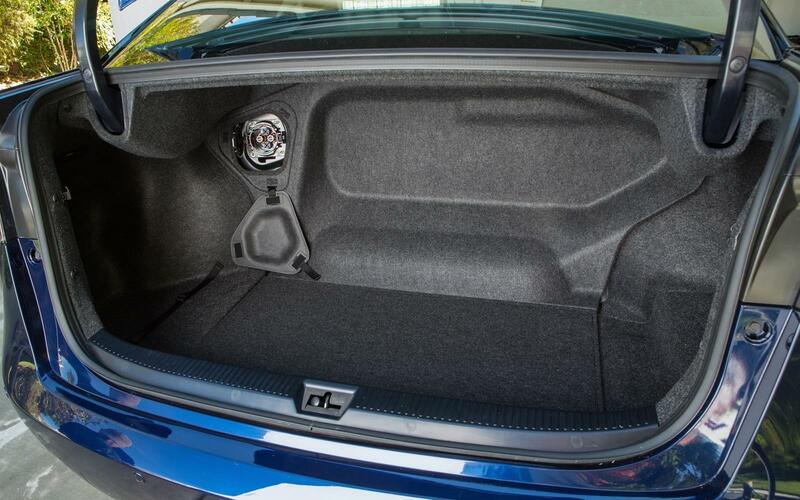 Despite the mid engine layout and heavy hydrogen tank, the boot space is reasonable in the Toyota Mirai. 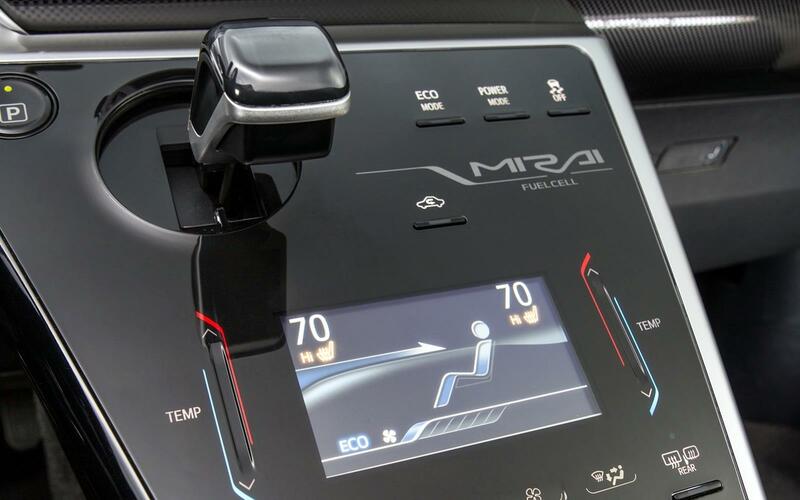 Futuristic gear selector and touch panels dominate the dashboard of the Toyota Mirai. Sam is an automotive writer with experience of virtually every make, model and specification of car in the UK. If it's got wheels, Sam's got it covered. 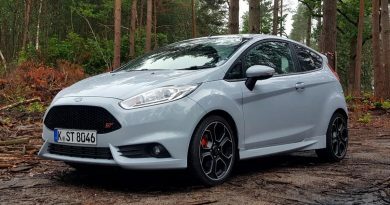 Just happened to come across this website while looking for car reviews… And as I am a car novice reading write ups about cars I suppose I need to know or at least find out about the acronyms used by reviewers such as you. Sorry but was a LPG car? 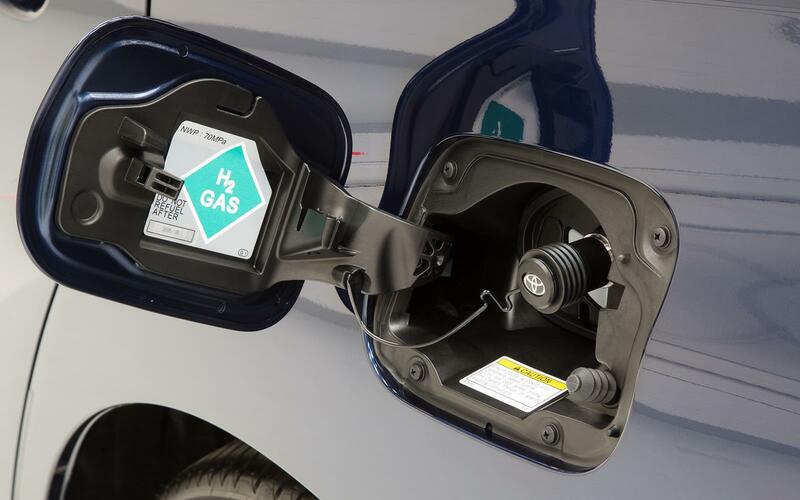 And whilst you test drove the car in Hamburg it’s confusing you mention there not being any hydrogen filling station specifically in Ireland like as if you was there when you wrote this…but later stick to the UK reference…hmmm confusing read. What would help and to be more to the point… use acromyns but also use the long form (normal form that is..) helps us readers that aren’t so car capable… Unless of course the target audience is for the car intelligent..then I have no idea why you would waste a paragraph and a half on nonsense about a film rather than the car itself. Bravo. Problem I have found and it’s not just isolated to you Sam…this website frontseatdriver/Phil Huff, is laden with reviews that show more than a passing resemblance of Jeremy Clarkson wannabe tribute acts. Come on people… Let’s at least try to be different. Thanks for the feedback, Julia. I’ve corrected the hydrogen station part – UK figures had been missed out for some reason. LPG is the accepted name for liquified petroleum gas, a fuel that you’ll find in many filling stations around the country labelled as just LPG – I’d hazard a guess that very few LPG users even know what LPG stands for. There’s a link between Mirai and Back to the Future that should be pretty clear, while this review was written on that famous BTTF day. 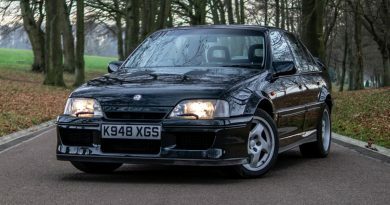 I could have just written a list of specifications for the car, and some people would undoubtedly prefer that, but I like to allow my writers some freedom to express their own personalities. Talking of which, if you don’t like the writing style then that’s absolutely fine. However, nobody here is trying to be anybody but themselves, and that won’t change. Thanks Phil, I appreciate your timely response. Respect.